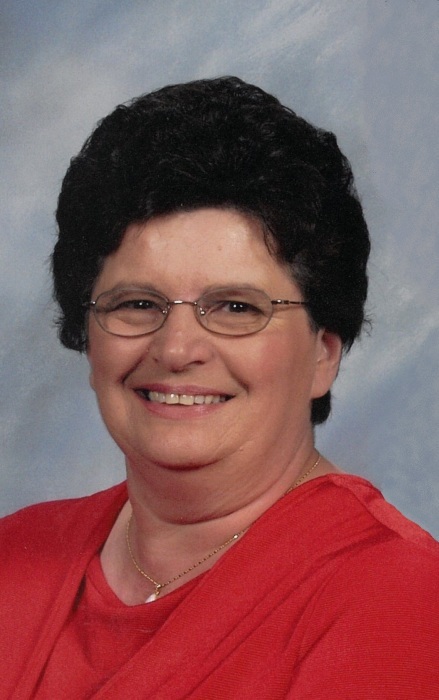 JoAnn Marie VerKuilen, age 73, of Little Chute, passed away on October 18, 2018, surrounded by her loving family at Theda Care Regional Medical Center, Appleton. She was born on June 8, 1945, to Joseph Porto and Ethel Krieck. On August 31, 1967, she married Robert VerKuilen at Sacred Heart Catholic Church, Appleton. JoAnn enjoyed spending time up north, sewing and going out for a good old fashion. Her favorite holiday was Christmas, and she made it so special for her whole family. She had a wonderful tradition of baking Christmas cookies with her daughters and granddaughters. Most of all, JoAnn loved spending time with her family, especially her grandchildren, they were her pride and joy. Her smile, hugs, wit, laugh and compassion will be dearly missed. JoAnn is survived by her husband of 51 years, Robert VerKuilen; a son, Mark (Teresa) VerKuilen and children: Andrea (Jake) Horn, Grant, Stone and Chance VerKuilen; a daughter, Karen (Jim) Desens and children: Rachael Etka, Jon (Stephanie) and Hunter Desens; a daughter, Stacy (Kevin) Doucette and children: Jade, Addison and Maverick Doucette; one great granddaughter, Laureli Horn; a sister, Shirley (Whitey) Mulroy; brothers: Richard Porto and Moxy Krieck; sister-in-law Patricia Porto; brothers and sisters-in-law: Robin (Tom) Wipperfurth, Rick VerKuilen and Ron (Colleen) VerKuilen. JoAnn was preceded in death by her parents: Joseph Porto and Ethel (Slim) Krieck; a brother, Donald Porto; father and mother-in-law, Gordon and Dorothy VerKuilen. Funeral services will be held at 4:30 p.m. on Tuesday, October 23, 2018, at St. John Nepomucene Catholic Church, 323 S. Pine Street, Little Chute, with Fr. Ron Belitz officiating. Visitation will be at the church on Tuesday from 2:30 p.m. until the time of the Mass. Interment will be in St. John Cemetery, Little Chute. In lieu of flowers, a memorial is being established. For online condolences, please visit www.verkuilenfh.com. The VerKuilen family would like to extend a special thank you to the staffs of the ICU at ThedaCare Regional Medical Center, Appleton and the St. Paul Home for the wonderful care and compassion. Also a thank you to all of JoAnn’s family and friends for the outpouring of support and love.